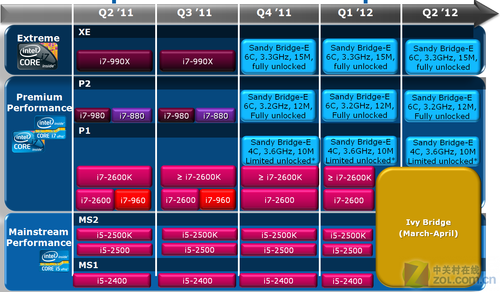 Intel has officially released a new Roadmap which details the release of upcoming Ivy Bridge and Sandy Bridge-E Processors. We already reported the delay of Ivy bridge processors from First Quarter of 2012 or Q2 2012 here but that was just a rumor surfaced by the Chinese media. 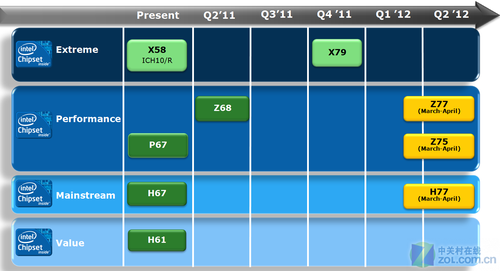 Now Intel has finally confirmed this by releasing a new roadmap which shows the Launch date of Ivy Bridge to be set in between the end of First Quarter and Q2 of 2012. The roadmap also confirms that the 32nm Sandy Bridge-E processors which would be compatible with the LGA 2011 socket would be available during the Fourth Quarter of 2011. The models would consist of locked/Un-Locked Multipliers Quad and Six Core variants support four-channel DDR3 memory. The Sandy Bridge-E will also replace the current LGA-1366 Core i7 lineup. The first Extreme Edition Sandy Bridge-E processor would be a 6 Core model with Core speed of 3.33Ghz, 15MB L3 Cache and an Unlocked Multiplier which would replace the current Extreme Edition 990X processor and would remain the fastest until faster units arrive in Q2 2012. The Sandy Bridge-E Consumer lineup consists of 2 CPU’s. One is a 6 Core model featuring Unlocked Multiplier, 3.2Ghz Core clock and 12Mb L3 Cache. The second model is a Quad Core (Limited Multiplier) rated at 3.6Ghz with 10Mb L3 Cache.